1284034798 -Each new print copy includes Navigate 2 Advantage Access that unlocks a complete eBook, Study Center, homework and Assessment Center, and a dashboard that reports actionable data. 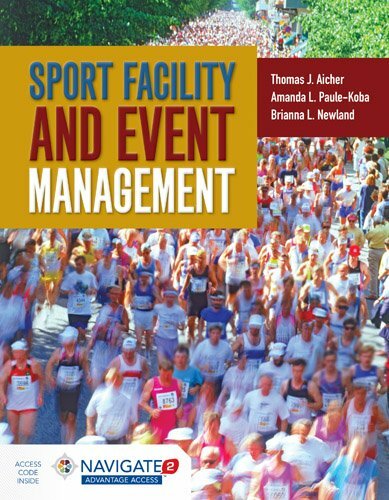 Written with both the graduate and undergraduate student in mind, Sport Facility and Event Management focuses on the major components of both facility and event management planning, financing, marketing, implementation, and evaluation. It integrates timely theoretical foundations with real world practicality and application to provide the reader with a strong foundation in facility and event management. The authors focus on a broad range of facilities and events to demonstrate the diversity of the industry, which encompasses recreation, leisure, health and fitness, in addition to the more commonly discussed sport facilities and events. The texts robust pedagogy includes chapter learning objectives, industry expert spotlights, vignettes, case studies, discussion questions, and tip points, as well as actual examples from the industries incorporated throughout the book.